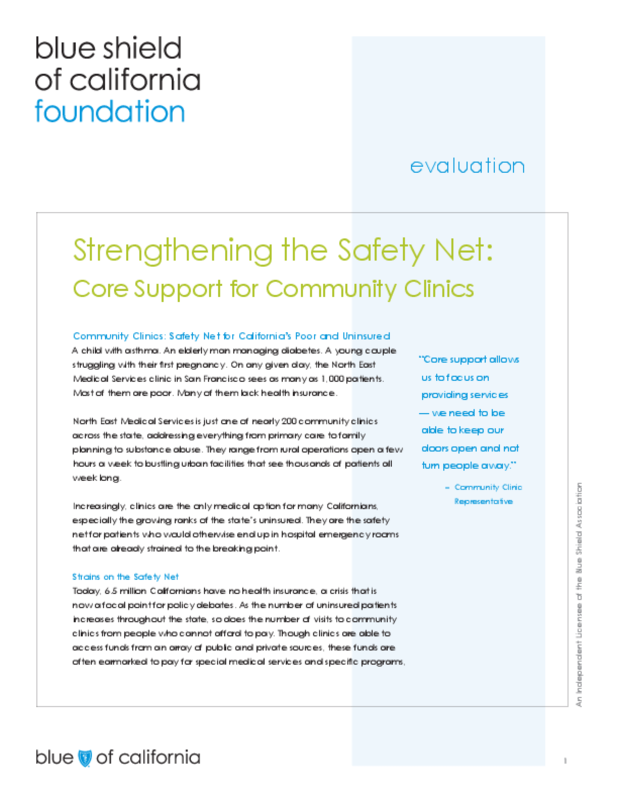 This document summarizes findings from the first, comprehensive evaluation of Blue Shield of California Foundation's (BSCF's) Core Support Initiative. Between 2003 and 2006, BSCF invested more than $12 million in nearly 200 community health clinics, parent corporations and clinic consortia/networks. These grants provided clinics with the flexibility to cover whatever they needed most, from untiltiy bills to hiring new staff to expanding services. Among the findings: core support stabilizes clinics and therefore strengthens the entire safety net, helps clinics raise additional funds, and boosts staff morale. The full report, "Core Support Initiative Evaluation," also is available through the NNCG Knowledge Center. Copyright 2007 Blue Shield of California Foundation, Putnam Consulting Group, Inc..